and the abandoned camp was never investigated, until now. What really caused such a terrible accident? Follow the clues, study the evidence, and learn the truth behind the Lennon Park Massacre. their sim to make this amazing new game for you. and make this dark and horrific story. Here is a little interview with Darth. that we are using for Lennon Park? What was the inspiration? Well...I Lost my pops in 2011 and with part of the settlement I bought the Sim and named it after an island that he owned and lived on year round. The Sim name is a combo of that and the river he fished his entire life. So the sim is my tribute to the greatest man Ive ever known. 2. What is you part in the Lennon Park Massacre with MadPeas? I Built/ landscaped pretty much everything on the sim and with the help of the MadPea crew I've been able to optimize it. The things you guys do are remarkable and hopefully the sim will stand the test. 3. 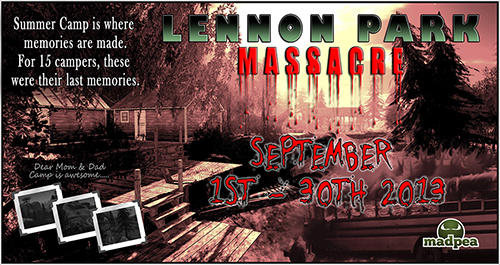 What are you looking forward to the most with The Lennon Park Massacre? 4. What are you are going to do with the sim after The Lennon Park Massacre? Well, after I finally clear all the cobwebs and police tape Im going to find a few more spots and put some houses down for rent. Keeping the sim going is an important thing for me and renting seems to be the best option. I not only get to share my vision with my friends but hopefully with 100's of others that Appreciate it. time to descend. 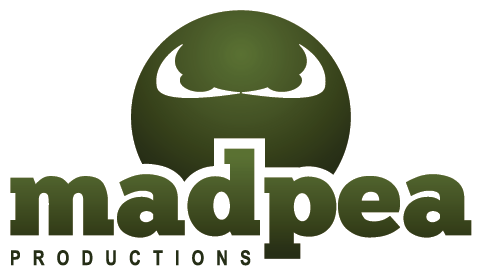 . .
Yay I <3 lennon park + mad peas!